The North Cellar Kitchen, which is also called Dolley’s Kitchen, appears to have been used as the primary kitchen for Montpelier from ca. 1812 until the duPonts built their larger kitchen addition in ca. 1910. Because this functional space was used for such a long period, the room underwent many renovations. 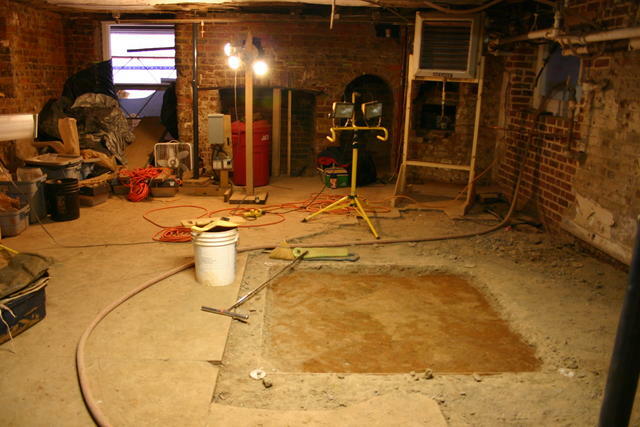 One of these renovations was a poured concrete floor that the duPonts installed in ca. 1901. No documentary evidence survived that revealed the type of flooring that the Madisons used in the kitchen and so the Restoration Team knew that the only hope for discovering any information about the ca. 1812 floor had to be found under the concrete floor. The North Kitchen at the start of the archaeological investigation.